Ask fellow campers about "Kanab RV Corral" and nearby attractions. We enjoyed our stay at this park. It is small and the sites are a little close together, but certainly not uncomfortable. The sites are level and the whole park is gravel. The staff was very friendly and helpful about the area. They claim to have super fast wifi. We didn't find it to be 'super' fast, but it was usable. We had good Verizon cell signal. Even though the park sits between two streets (one of them the main road coming in to town) there was very little traffic noise. We would absolutely stay there again. Our only real complaint is the price is high. I don't like paying over $30 or $35 (at the most) and $42 and some change was a little too much for this park. 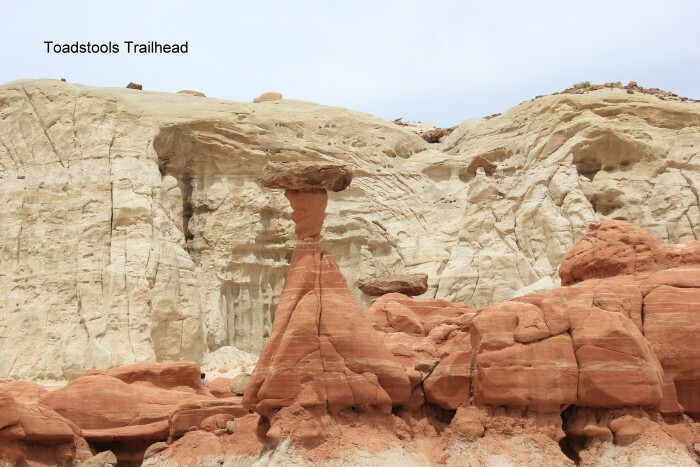 We camped at Kanab RV Corral in a Fifth Wheel. Very Nice park. Everything very clean. Nice fenced dog yard. Lady at the front desk was very helpful very nice. We camped at Kanab RV Corral in a Travel Trailer. Very friendly owner. Our site was next to the pool which was closed for the season. Located on a main highway in town, but typical small town...gets pretty quiet at night. Walking distance to restaurants and local stores. We camped at Kanab RV Corral in a Motorhome. Stayed here 2 weeks, and it was a great town to use as base of red rocks exploration for Zion National Park, North Rim Grand Canyon, Page/Lake Powell, AZ, Grand Staircase Escalante. Nice small campground, with all gravel roads and level sites. Maneuverability varies with where/how your neighbors park their vehicles, and what area you are in. Some of large sites on back row are angled the wrong way from the one-way entrance, and caused a number of people some problems. Sites in middle are really squeezed, but owner and staff do try to take them into account when assigning sites, as the sites are coded by whether they can take slide outs or not. Next to busy road, so highway noise is unavoidable. Owner and staff very friendly, and owner really takes pride in the upgrades he has done, especially electrical and WiFi. Unfortunately, a couple of power pedestals are too low to ground to use an external EMS device (including mine), but power was stable for 2 weeks. Wifi signal strength was good, but we were still bumped off frequently, so I guess bandwidth still lacking. Verizon coverage excellent. No cable, but good broadcast TV. Bathroom, shower, and laundry facilities very nice and clean. No camp store. We camped at Kanab RV Corral in a Fifth Wheel. Town is easily walkable or bikeable from camp, and has tons of interesting signs about actors that have been there when it was capital of Western theme movies and TV shows. Several really good restaurants too. Our site was ok but it seemed like one they had stuck in a leftover place in the driveway. We were very close to the road and luckily it wasn't noisy at night. At least we didn't have anyone next to us but people did have to walk around our RV to get to the restroom. We would probably stay here again is we're in Kanav. 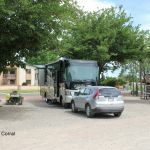 We camped at Kanab RV Corral in a Motorhome. Traveled with another party and they were able to get us side by side in two very nice spots secluded by trees. The owners are super friendly and they're working very hard on their park. This is my third stay here in a year and there are always improvements being made. This is our go-to park when we come to Kanab. We camped at Kanab RV Corral in a Motorhome. Make sure you tour Best Friends Animal Sanctuary. It's 5 miles up the road. Well worth the time if you like animals at all. They do great work. This is a very well kept park. The owners are very personable. The restroom facilities and pool area are kept very clean. The spaces are roomy. It is on a main street. Centrally located. This is the second time we have stayed here. 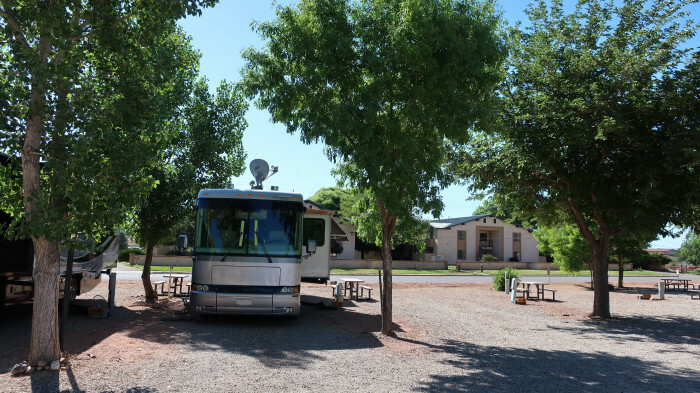 We camped at Kanab RV Corral in a Fifth Wheel. Kanab is a nice area that is located close to Coral Sand Dune State Park. It is also the site of many, many Western movies. Good for a day trip to Lake Powell. Excellent small park with good power, water and sewer hook ups. The best wifi in any park I've ever been in. The owner encourages you to stream TV if you can't connect to satellite. Nice drive to Bryce and Zion. Grocery stores close by with restaurants, ATV tours, etc., all within 10 minute drive. Kanab is an interesting small town and even though no Walmart was close by, we shopped local with out any problems. 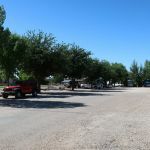 The park is gravel and at the edge of town and is kept up by the owner and the work campers. A real gem. Would stay here again. We camped at Kanab RV Corral in a Motorhome. $40.50 (including GS discount and taxes) for a 50amp full service back-in site. 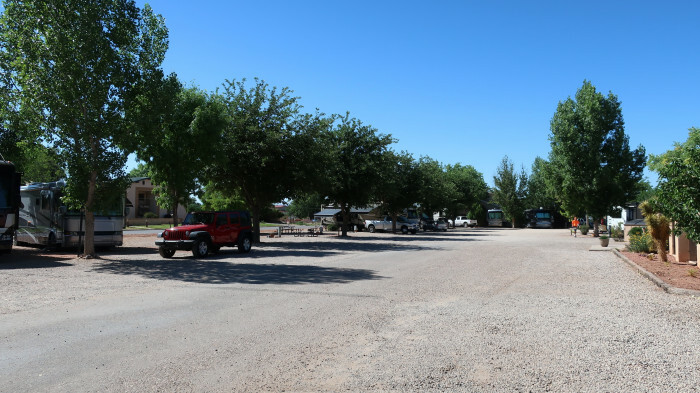 This is a small RV park that is meticulously maintained. As others have noted, sites are close together, but that is my only complaint. WiFi is the best I have ever experienced in an RV park - possibly due to it being fiber optic and the owner being a retired IT person. All of the picnic tables appear to be new as do the washing machines, dryers, and the furniture in the pool area. The restrooms and laundry room are spotless. There are two grocery stores in town with Honey's Marketplace being the larger. Several gas stations sell diesel prices, with Honey's gas station having the lowest prices. With Zion Ntl. Park being only 40 miles away, a day trip is possible. We camped at Kanab RV Corral in a Fifth Wheel. This park is OK. Sites are VERY close together, and you are bordered by a street in back and a busy street in front. Pool was fine. Very small dog run area. Park was all dirt/gravel. Dusty, but this IS the desert so I guess that's to be expected. Our traveling companions were charged extra for the 3 kids they had with them. Seriously? Is this necessary? Kanab is a great little town with good places to eat, and of course, Best Friends Animal Sanctuary. You would think that there would be nicer RV parks in this area, but there aren't much to choose from. We camped at Kanab RV Corral in a Fifth Wheel. New owners have made this centrally located campground an oasis with a beautiful pool, new patio furniture and manicured grounds. We will definitely stay here again. You can walk right into town to grocery stores, restaurants, and shops. WIFI was excellent. Verizon was three bars. One tip-our site #20 was a back in but it was difficult to back straight in because of the angle of the sites. I would suggest that you pull up to the pool area, unhook, and see if you might want to drive the RV down to the wide section of the dog leg and turn it around so that you're now facing the way you just came in. That way it will be easy to back into your site. We camped at Kanab RV Corral in a Motorhome. 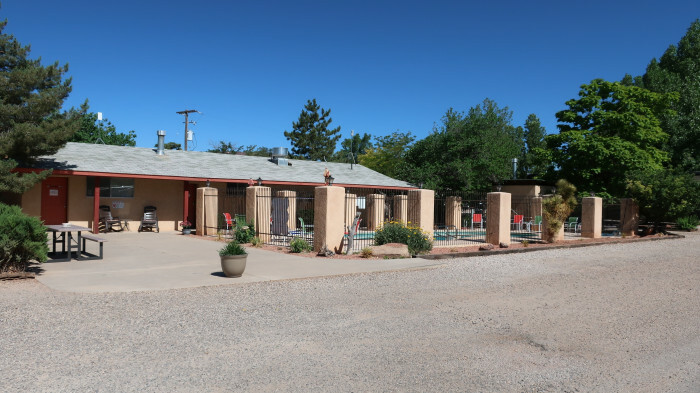 Be sure to visit Best Friends Animal Sanctuary, Parry Lodge (walk around and look at the names of movie stars who stayed in some of the lodge's motel rooms). Go to the Kanab Outdoor Market Saturdays from 4:00-9:00 at the Comfort Suites, 150 W. Center St, and be sure to go see the amazing Western music show at the Redstone Theatre. Fantastic musicians and singers! Also check out the Little Hollywood Movie Museum and the Kanab Visitors' Center. I love this little town! Great campground in a gorgeous part of Utah I didn't know about! Everything is gravel, but well packed. Nice clean pool, laundry facilities were good. WiFi was excellent. Sites are about normal for a private park, so kinda close, but not touching neighbors. Dog park had grass! Nice size area for the pooches. Lots of interesting history around. This was a big filming spot for old westerns. No "camp store" but plenty of restaurants and grocery's nearby. We camped at Kanab RV Corral in a Travel Trailer. There is a driving trail about 10 miles away that you can see lots of places that have been used for a backdrop in old westerns and even the old set of "Gunsmoke". We found this park by accident due to a change in plans. Owner accommodated us on short notice. Sites are shady (most) and wi-fi is terrific. Lots of resources close by (markets, gas, etc). Hour and a half to Bryce and about an hour from our destination - Springdale. Would definitely stay here again. We camped at Kanab RV Corral in a Fifth Wheel. Avoid alternate route 89 coming from the south unless you want to see the Vermillion Cliffs. We used this campground as our base for exploring Grand Staircase Escalante National Monument. Although we were backed onto a residential street, it was quiet. 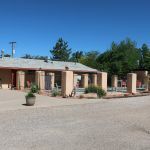 The town of Kanab has all the neccesary commercial amenities. 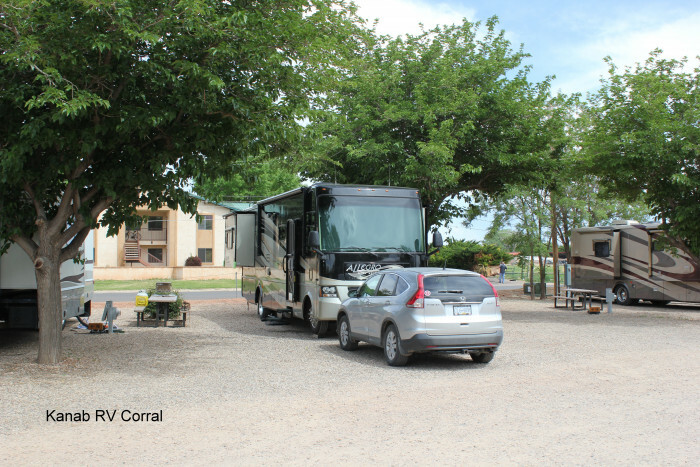 We camped at Kanab RV Corral in a Motorhome. Bryce Canyon, Zion, etc. all within easy driving distance. If you spend $50 or more at the Honey's Marketplace (good grocery) you get .15 off each gallon of fuel at the corner station. I filled up 100 gal so I was happy. We ate at Nedra's Too, just across the street to the north. There was a bit of a long wait for the food, but it was good. Ask to be on the row furthest from Highway 89A. Had a very nice dinner at Wild Thyme Cafe. A new CG is under construction at the East end of town. Peekaboo Canyon restaurant is excellent. Escobar's is a nice family-run Mexican restaurant. Both offer outdoor patio seating. Hiking and sightseeing is amazing with all of Utah's best parks within an hour away. Short driving distance to the Grand Canyon, Zion, Bryce and other parks. Tons of hiking and off road opportunities. Also it has many old movie sites from westerns back in the day, and amazing mom and pop shops and restaurants. We explored Moqui Caverns that is about 10 minutes away. Most areas are within walking distance (main street shops about 15 minutes). We really enjoy this town and our campsite. While in town visit Escobar's for good Mexican food. Not a fancy place, just great food and great service. Some of the "foodie" places in town don't have such great food. Propane is available in town at Silver Eagle service station. Ate at Houston's Trails End Restaurant and the chicken fried steak and coconut pie was to die for! 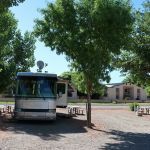 Great RV park to use if you want to see the North Rim, Bryce and Zion. There are two entrances. Once you pull in the main entrance, your screwed. Either back out onto the road and enter the unmarked way, or turn around in the park to back in your site. Convenient to town and driving distance to Zion ad Bryce Canyon. Best Friend Animal Sanctuary was a big surprise just outside of town. A must see for Adults and kids. Rocking V, Trails End, and Iron Horse are some of the many good restaurants in town. The Drug Store soda fountain is a fantastic place for ice cream. Coral Pink Sands State Park is large sand dune you can hike and sled on. There's a fire station next door with nice grass and sidewalks for walking your dog. Little Hollywood has buildings from movies filmed in the area. The Best Friends Animal Sanctuary is a worthwhile visit. The Soda Fountain at Kanab Drug...yum, yum! A memorial to Levi Stuart, the founder of Kanab, Utah. Bryce Canyon, Zion Canyon, and the North Rim are within a reasonable driving distance. Volunteer at Best Friends......or go do the tour. Kanab Tour Company for a trip to some incredible local places. 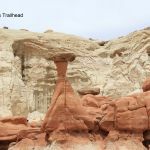 Paria River Canyon and The Toadstools. Best Friends Animal Sanctuary tour a must. We loved Kanab. Take a walk into town and don't miss the visitor center, lovely town with nice restaurants. Best Friends Animal Sanctuary tour is amazing, Pahrea Canyon is beautiful, Johnson Canyon offers off road ar as off the main road, Angel Canyon again spectacular. It's a short distance to Zion. The trading Post in Kanab with the old sets is neat. You have to visit Houston's Restaurant and try the Chicken Fried Steak and Coconut Cream Pie. A short drive to Zion National Park and the Coral Pink Sand Dunes State Park. About an 1.25 hour trip to Bryce Canyon. Lake Powell/Page/Antelope Canyon/Horseshoe Bend is about 1.25 hour trip the other direction on Scenic Highway 89. Three night minimum stays over holidays and special events. You can day trip to Zion. One of the finest animal sanctuaries in the U S, "Best Friends", is just north of two and wonderful to visit. Plenty of eateries, gas stations, stores nearby. About 80 miles from Bryce Canyon National Park. Take one of the free tours at the nearby Best Friends Animal Sanctuary (and then make a donation)! Visit Zion and Brice NP. Brice is a bit of a haul but Zion is easy. Go to Pink Coral Sands State Park. Kanab is a cute town with lots of cute shops and good eating places for such a small town. It has a great hardware store with everything you could possibly need. May take the owner to find it but he will. Best Friends Animal Sanctuary in Kanab Canyon is a must see. Zion and Bryce Canyon National Parks are a couple of hours from here. For a special night out, consider Rockin' V restaurant. Great food but get reservations. For good comfort food, try Houstons. Kanab is also the center of some wonderful off=road adventures. Check out Kanab Tour Company's website for a trip to some incredible local places. You must visit Best Friends Animal Sanctuary. It's the largest one in the US and they are just amazing. There are so many things to do out there, including volunteer. There are free tours and the scenery is breathtaking. Kanab is a centrally located town to visit Bryce and Zion National Parks as well as shop for basic food needs. There are restaurants and shops in town as well as a very nice hardware store. One ought to visit the Hollywood museum in town if you're staying here. Kanab is centrally located among many attractions. Zion, Bryce, Vermillion Cliffs, Grand Staircase, North Rim, Lake Powell are easily accessed. One must visit is to Best Friends Animal Sanctuary. The Kanab RV Corral is a great choice for a base camp. The Grand Staircase-Escalante National Monument Visitors Center is here in town. If you are a hiker, this is the place for you. Many hiking areas in the park. Stopped and got an ice cream cone at 3 Bears. It was very good. This park is .3 of a mile from the intersection of 89/89A. Very convenient. Don't miss Bryce Canyon National Park! It's an easy day trip from Kanab. Are you affiliated with Kanab RV Corral ?